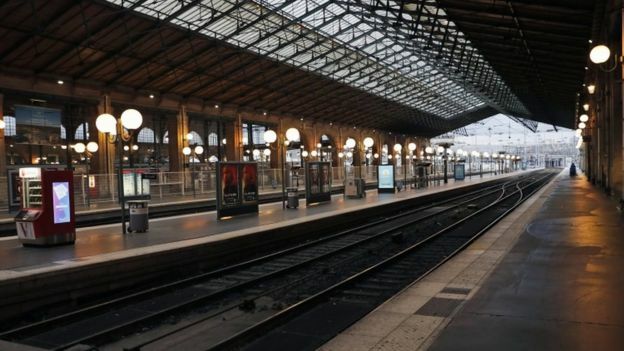 France’s rail network has been severely disrupted, as a wave of strikes against President Emmanuel Macron’s labour reforms gets under way. The start of the strike has been dubbed “Black Tuesday”, but the action will spread over three months, affecting two days in every five. The unrest presents Mr Macron’s biggest challenge since his election last May. The unions say some of the plans to overhaul the heavily indebted SNCF would pave the way for its privatisation. But Prime Minister Édouard Philippe denied this, saying the proposals aim to change the status quo that was “no longer tenable”. 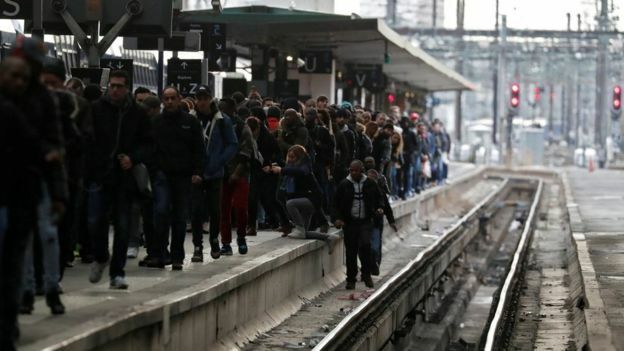 SNCF warned that major disruptions were expected on Wednesday. How is the strike taking hold? Only one in eight high-speed TGVs is scheduled to run while only one in five regional trains is operating. Travellers across Europe suffered more disruption as up to 15,000 flights across the continent were facing delays due to a technical problem. Eurocontrol, which runs the EU’s air traffic system, said the fault in the system had been identified and that moves were under way to return the situation to normal. Can Macron face down the strikers? First, unlike in the last massive (and successful) general strike in 1995, this time there can have been no mistaking the government’s intention to reform. Neither the public nor SNCF staff can pretend the planned changes come out of the blue. They are clearly part of the broad reform agenda for which Mr Macron was elected. The rail unions also feel their action goes beyond rail workers’ conditions and marks a major test of union clout. Just over 11% of the French workforce is unionised – one of the lowest levels in the EU – but the unions traditionally punch above their weight, economically and politically. “We’re defending the French public service, not just rail workers,” said Emmanuel Grondein, head of union Sud Rail. Mr Macron’s Republic On The Move party also feels the strike has wider connotations. “We need to rid this country of its strike culture,” spokesman Gabriel Attal said. Opposition to Mr Macron’s agenda was shown on 22 March, when tens of thousands of teachers, nurses and other workers joined rail staff on strike. The BBC’s Lucy Williamson in Paris says many union members see Mr Macron as the man who wants to break the power of the unions.